As high-resolution videos becomes more popular, Team Group Inc. exclusively released the premium high transfer speed multimedia storage: microSDHC Class 10.and is downward compatible with SD 2.0; With FAT32 file system,and provides a minimum transfer rate of 6 MB/s, images, video game or Commercial and other applications. Which can give user satisfy today’s diverse multimedia needs. Together with Team Group’s adaptor, the microSDHC Class 10 memory card is compatible with all digital devices available on the market marked with SDHC & MiniSDHC support. Device such as cell phones, digital cameras (DSC), MP3 players, gaming devices and personal digital assistants (PDA). 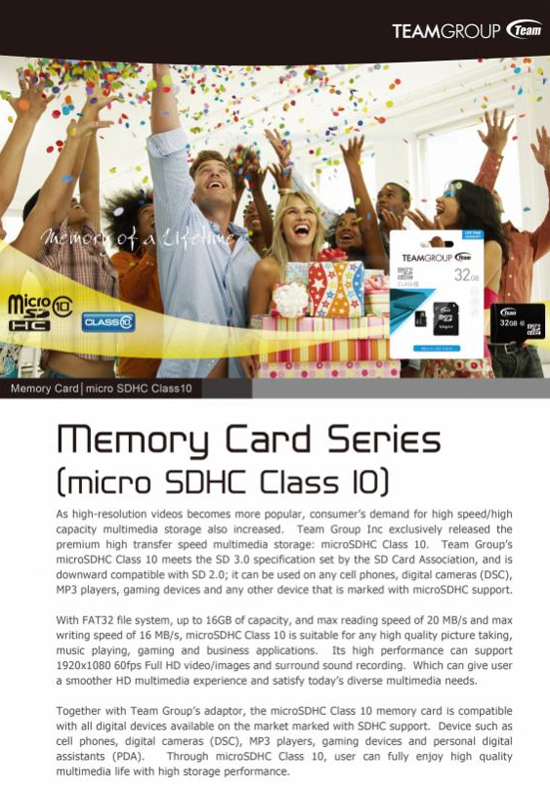 Through microSDHC Class 10, user can fully enjoy high quality multimedia life with high storage performance.